Porsche restoration shop Singer plays every card in its deck to peel weight from classic 911s and calls on a Formula 1 engineering offshoot for help. Air-cooled Porsche 911 restoration and modification shop Singer Vehicle Design announced Thursday that it will unveil two heavily-modified cars that result from its Dynamics and Lightweighting Study (DLS), a project cooperatively tackled by Singer and Formula 1 team offshoot Williams Advanced Engineering. DLS was conceived when Singer customer Scott Blattner requested as much weight reduction as possible for his 1990 Porsche 964, prompting Singer to link back up with Williams, as it did for its 500 horsepower, air-cooled, 4.0-liter flat-six, which in this car is attached to a Hewland six-speed transaxle with a magnesium casing and hollow shafts. The engine is but the starting point for the DLS cars, which exemplify weight reduction at its most obsessive to develop the air-cooled Porsche 911 platform to its full potential. Every body panel was redesigned based on computational fluid dynamics simulation to reduce drag, increase downforce, and improve cooling. All body panels are unique to the DLS cars, and all are rendered in carbon fiber to trim weight. Williams played with the 911's chassis to improve weight along with its distribution. It did so by scooting the flat-six forward, relocating as many components as possible to the frunk, and evaluating torsional stiffness to find areas of improvement. Williams also dedicated attention toward suspension components, pulling weight from the double wishbone suspension up front, and reworking the aluminum rear trailing arm. Adjustable shocks are controlled by Bosch dynamic driving modes, which allow the car to be driven with traction control, stability control, and anti-lock braking system, which modulates the Brembo carbon-ceramic brakes through special one-piece calipers. They slow the 18-inch, forged-magnesium BBS wheels clad in Michelin Pilot Sport Cup 2 tires to a standstill without lockup. Inside, Recaro pitches in carbon fiber seats and Momo, a carbon fiber steering wheel. The pedals, shift linkage, and instrument panel are made from a mix of titanium, magnesium, and carbon fiber, and the HVAC system enjoys lightening of its own. Two cars make their global debut at Thursday's Goodwood Festival of Speed, where one will race, and the other will bathe in the attention of more than 100,000 gawking festival attendees. They will later make their North American debut at Monterey Car Week, starting August 23. The car seen above will appear at the Goodwood House Display and its red counterpart will perform racing duties. 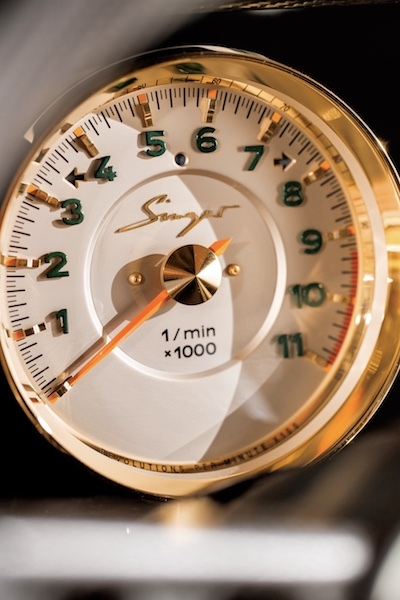 "The Dynamics and Lightweighting Study has been years in the making," said founder and creative director of Singer, Rob Dickinson, in the company's press release. "To see the results, representing the ongoing pursuit of our client's vision for their ultimate air-cooled 911, is so exciting. We've worked relentlessly to present a machine that visually celebrates the past while acknowledging the future—both inside and out." Dickinson continued, "It's our fourth year at this incredible event and we're thrilled to be back at Festival of Speed for its 25th anniversary and to wish Porsche a very happy 70th birthday." Five historic Porsches gather in Monaco to drive the Col de Turini stage once again. This special sale at the Porsche Experience Center Atlanta marks the first time a Paris-Dakar 959 has even been sold at public auction.